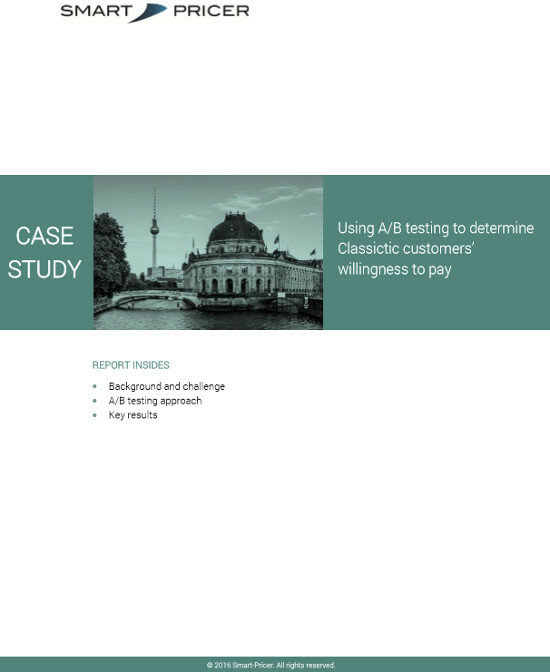 In this case study about Classictic, we are using A/B testing to determine Classictic customers’ willingness to pay. In this case study we explain the approach used by Smart Pricer to determine Classictic customer’s willingness to pay by using A/B testing. The Case study shows the used approach in details and presents the final recommendations for Classictic based on A/B testing results. Classictic had been working with a historically grown fee base of fixed fees per venue. The web portal operator asked Smart Pricer to optimize its fee structure to achieve a revenue increase. We approached the task with a historical data analysis of Classictic. Then we created three price groups to test the willingness to pay. At the end we applied the test results in optimal price points per venue and geolocation. For some venues and certain geolocations, the demand is highly inelastic to price.